In the last five or ten years, I’ve had a weird feeling that the entire Rock ‘n’ Roll world entered a strange time machine, like that one from H. G. Wells book novel. A great number of bands are trying to sound as THE BEATLES, ROLLING STONES and others. In some moments, we find very good works (although the notion that “we heard it before somewhere” can be annoying). 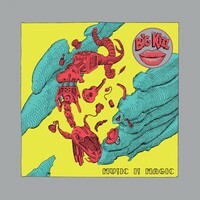 But bands as BIG KIZZ are a loss of our times, because “Music is Magic” is recollection of many musical clichés. Sorry, but the eclectic approach of Rock ‘n’ Roll that this trio presents on their songs is something, using some groove elements from early Soul Music (like names as EARTH WIND & FIRE, JACKSON FIVE and other from old and good times from Motown Records), that was used many times before in the past. Even if we compare their musical work with a titan such as THE NIGHT FLIGHT ORCHESTRA, they can look like a kind of crippled band. They have good melodies, some catchy moments, of course, but the creativity they need to show is drown in a sea of musical clichés, and it can sound boring for experienced guys. The sound quality of “Music is Magic” is another weak point: it is done like they were in the past. This crude sound doesn’t fit on our days, and they could have chosen a better set of instrumental tunes as well. Filthy and raw doesn’t mean that an album sounds organic, just poorly produced. Ten songs are waiting, a real trial for your patience sometimes. “I Gave Up Tears Ago” (good chorus and melodies), the Punk Rock influence heard on “Baby Boy”, the charming harmonies of “Lose My Love”, the energy of “High” and their version for BIKINI KILL’s “Rebel Girl” are the songs that can catch your attention, but soon you’ll become bored with them. Come to the present day, evolve and let’s see if they can do better than we hear on “Music is Magic”. Leave the 60s and 70s aside, please!